One morning the other day, as I sat down at my desk at work, I was just HIT by the most intense craving for apple cider donuts. It may have been because the air was deliciously cool and crisp as I walked to my building, hinting at the first signs of autumn. Be that as it may, sweet cravings are usually unexpected for me, because I’m not the biggest fan of sweets. I know, I know, I’m crazy. But get this – for my birthday growing up, I’d always ask my parents to get me one of those huge tubs of cheese balls – you know, the synthetic orange kind – which I would then hoard away and eat on the sly. In fact, I remember vividly this one time my mom caught me hiding behind the couch, shoveling cheese balls into my face, fingers sticky with orange powder. A part of me likes to think that my love of all things salty comes from my grandmother (who died of breast cancer when I was nine). My mom always said she salted and oversalted her food -which may not have been the healthiest thing to do, but was a distinct quirk that stood out to my mother. My grandmother was such a special lady. Think of the kindest, most loving, and most thoughtful person ever, and then multiply them times fifty. That was my grandma. I could write for hours about the infinitely thoughtful things she did for me, my sister, and my cousins. Something that really stands out in my memories are the times I’d stay over at my grandparents’ house for the weekend. My grandpa would always fall asleep on the couch with the TV blaring, without fail, and would sleep there the whole night, snoring loudly. As a child I was always an early bird, but no matter how early in the morning I would awaken, my grandma would always be up before me. I’d go out of my little bedroom and find my grandma in the kitchen in her pastel-striped night robe. For breakfast, I was allowed to have a bottle of Sprite, Lucky Charms (just the marshmallows, of course), and a few clementines. It felt wickedly wonderful having such a sugary breakfast, knowing that my mom would keel over if she knew what I was eating!! Nothing like having breakfast at grandma’s. That morning the other day when I really wanted an apple cider donut, I thought of my grandma again. Every fall, she and my grandpa would take me to the apple orchard + pumpkin patch. Grandma would always get me some apple cider donuts, which I would snack on with reckless abandon. Everything always tasted better when it came from grandma. I miss her so much. When I was with my grandma, it felt like magic was alive in the world, and that happiness was not only attainable but a natural state of being. Her being gone is even harder on my own mother, who I know thinks about her every day. My mom and grandma used to call each other on the phone every day, just to say hi. But it makes me happy to think that my mom and I talk every day now, too, and that we’re never too far away from each other. And although my grandma has joined the angels, I know her spirit stays alive in our hearts and through the memories we treasure – and that we will be reunited in infinite joy, one day, through Him. This recipe is for you, Grandma. I know if you were here you’d be so proud of me. I love you, always. Enjoy the best of autumn with these fluffy, vegan apple cider donuts, topped with powdered cinnamon sugar. In a bowl, whisk together dry ingredients until evenly combined. In another bowl, combine all wet ingredients except coconut oil. Mix. Once wet ingredients are fully mixed, stir into bowl of dry ingredients and combine. Note - the donut batter may fizz up a little, that's just the baking soda reacting with the apple cider vinegar! After stirring for a bit, add in the melted coconut oil and stir in completely. Spray your donut pan with coconut oil or another nonstick spray. Pour batter evenly between 6 donut molds. Bake donuts in the oven for 15 minutes. Once done, let cool for a few minutes. 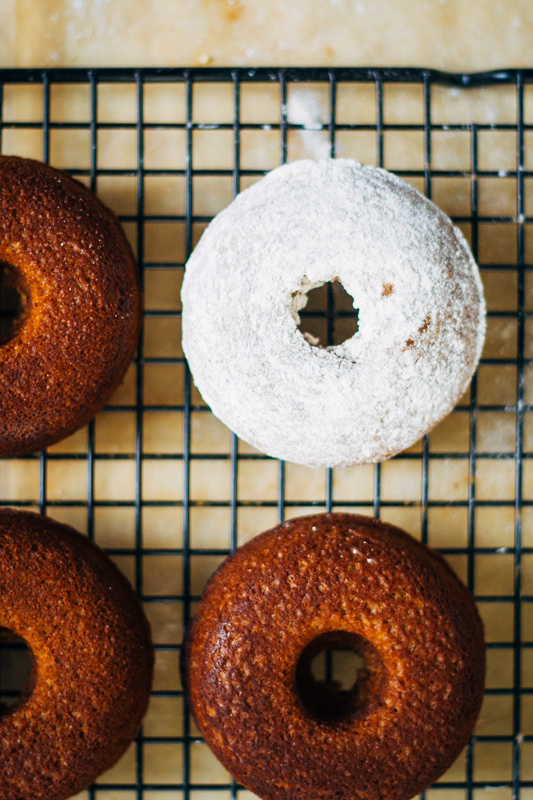 While donuts are cooling, combine turbinado sugar and cinnamon in a high-speed blender, spice grinder, or coffee grinder. Blend until sugar is a fairly powdered consistency. Once donuts are cooled, toss in cinnamon sugar. I just made powdered doughnuts a few weeks ago and the nostalgia of those mini packaged ones came back for me! Haha! Anyway, I love the apple cider take! These are so lovely! <3 Your grandma would be very proud! This is so sweet Sarah! I loved reading about your childhood memories and your grandma. I’m sure she was a very special lady, and she would be very proud of you. I don’t know about the rest of Canada but in French Canada it’s definitely not a thing. I’d never heard of them before reading your post. :) It’s so fascinating to see how culinary traditions can be so different from one place to another! I’ll have to give these donuts a try for sure!! These doughnuts look divine! Such a sweet story about your childhood memories of your Grandmother. I have a family full of salt fiends too. People usually cringe when they watch my father salt his food. I need to get a doughnut pan ASAP! This post was an absolute joy to read. I’m looking forward to trying this recipe, it looks divine! Yum, these look great! I’ve never been able to justify getting a donut pan, but one day…. Grandmas are the best, aren’t they? I love this post about your grandma, especially since it involves so many lovely memories and sweet treats :) I’ve had a hankering for donuts lately too, so I need to give your recipe a spin today for a Monday treat! grandmoms are the best and this is such a sweet story/memory. Im pinning this and waiting for the weekend because i havent baked donuts in forever!! I love donuts and love that these are healthy! Yum!!!. I wish I had some right now. Beautiful doughnuts! That cinnamon sugar … YUM! Aw Sarah, my grandma died from lung cancer (even though she was a non-smoker) when I was around 8 and it was rough. My mom and grandma were really close, too. My mom was diagnosed with Alzheimer’s a few years ago and since then I have missed my mom so, so much. I’m sure your grandma is smiling down from heaven knowing you are thinking of her and that you are able to enjoy these apple cider donuts in her place. What a sweet tribute to your grandma – she was clearly a very special lady! Isn’t it wonderful when we associate certain foods with such happy memories with our loved ones? These donuts look absolutely amazing. I’m not usually a donut kind of gal (I’m like your grandma – a complete salt addict), but these don’t seem cloyingly sweet like so many other donuts. I bet the tartness from the apple cider really brightens up the overall flavor, too. So perfect for the autumn! I can so relate to the wonderful memories of your grandma!!!! I was thirteen when my Meme passed away and she was my BIGGEST positive influence, especially when it came to cooking. She was the best cook beyond words and is the reason I do what I do to this day. Love these “Grandma” doughnuts! And I can picture you (even though I barely know what you look like :) sitting at the table relishing in Lucky Charms!!! What a sweet memory about your grandmother! 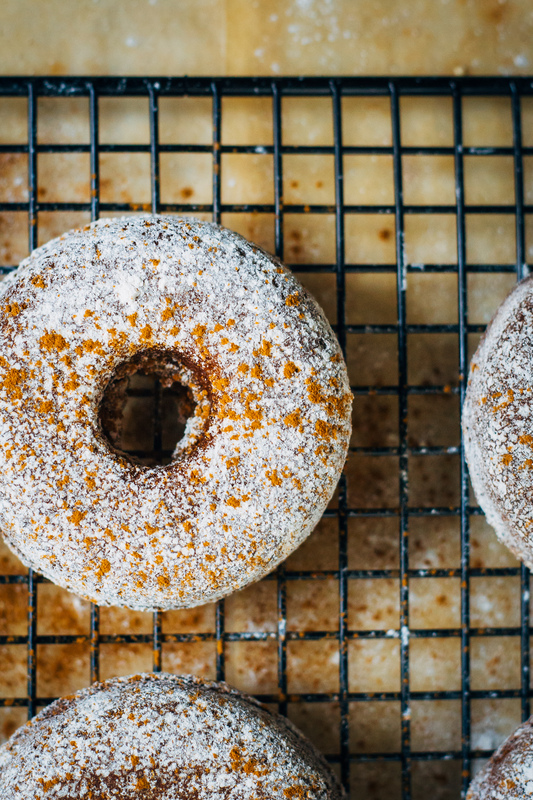 These apple cider donuts sound awesome, and I love that they’re vegan too. These look amazing! But I need to make them GF. What flour would you suggest using instead of splet? Wow! I found this on Pinterest, and I have to say that everything about this looks amazing! I love that you use applesauce to make the apple cider donuts. It must really bring out the apple flavor in a big way. Totally adding this to my fall baking lineup. Thank you! I don’t have spelt flour on hand…do you think oat flour would work? Perfect Saturday morning recipe. Thanks for this post and recipe. I made these for my wife and kids with a little alteration of substituting more cider and applesauce for the oil (since we are Whole-Food Plant-Based, which means oil free). These are fantastic. Thanks so much for sharing this. You rock my friend!!! What a delicious autumn apple treat! I can’t wait to try these! I love baked doughnuts – and I don’t think these will last long in our kitchen either ? Graham flour in the future. 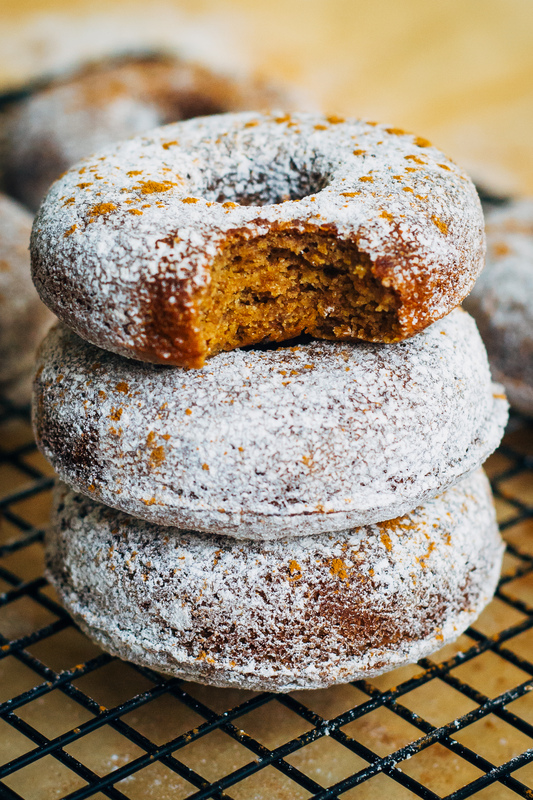 Thanks for posting recipe I have missed the cider doughnuts I used to buy at the Brooklyn farmer’s market years ago. Would this recipe work with buckwheat flour or banana flour? I haven’t tested it with either of those flours; I’d imagine buckwheat would work but I’ve never heard of banana flour! I used brown rice flour and they were amazing!